Your potential customers have a world of options and information right at their fingertips. Providing them with SEO solutions to their needs and helpful information is what search engines and your website should have in common. 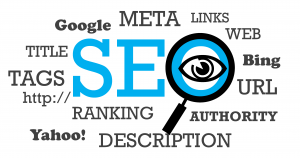 Search Engine Optimization or SEO is a buzz word that gets thrown around a lot in the digital marketing field, but it’s not just an interesting phrase. It is well known that most people only view the first page search results on Google, so why would your potential customers be any different? Increasing your organic search engine ranking is one of the main goals that we have for your website. SEO implementation involves optimizing your website based on keywords related to your specific industry. SEO helps potential customers to easily find your website on the top search engines, such as Google, Yahoo and Bing. Our SEO team will perform industry-based keyword research, implement keywords in the website content and web page titles, and monitor your website’s organic search engine ranking over time and much more. What good is having a website if your next customer can’t find it? Increase the number of potential customers that view your website and your ROI with FusionTech Media’s SEO services! Our versatility and depth of knowledge about various Internet Marketing strategies allows FusionTech Media to apply best practices across multiple industries. FusionTech Media combines in-depth marketing research with creativity. We can create professional branding, a visually appealing website and an original web app specifically for your industry needs! © 2019 – FusionTech Media – All Rights Reserved.